Birds of a feather flock together they say, and the same is true of travelling bees looking for a hive. Welcome to Beehive (not the one made of wax of course!). Centrally Located in the Banjara Hills, this hostel is placed amongst the best eateries of Hyderabad. Beehive is eco-friendly and equipped with all modern amenities. * large common space to lounge & meet other travellers. * hassle free & most accommodating check-in check-out times. At BeeHive, we place our faith in the concept of ‘community living’. We are a supporter of sustainable and responsible travelling. We are gender neutral, perfect for solo or group travellers. You can reach the property from Rajiv Gandhi International airport through direct Airport bus or cabs. All major city attractions, like Charminar, Karachi Bakery, Birla Mandir, Golconda Fort, Salar Jung Museum are within reachable distances. If you are looking for a home while on the road, this is where you will find it - along with loads of conversation, friendly nomads, food, music, and fun. It was great. Thanks for being great hosts. Beehive is at a convenient location which is nearby to all the must see places of Hyderabad. It's a very neat, tidy and well maintained place with Abhishek as a great host who is very responsive. The facilities are very good and it is worth the money! Behive is located just off main road and is easily accessible. Got a message from them a day before abt my arrival timing and i was happy they accepted my early check-in of 7 o clock in the morning.! They host was very polite ! Beehive hostel was just amazing and was looking for a place like it where I felt more like home. Its location is ideal and the dorms were neat and clean. Above all the host abhishek is gem of a person and made my stay wonderful. Surely Recommend! Perfect place for India-firsties and solo travelers! Very social, very clean, helpful staff... I came for 2 nights and stayed 4. 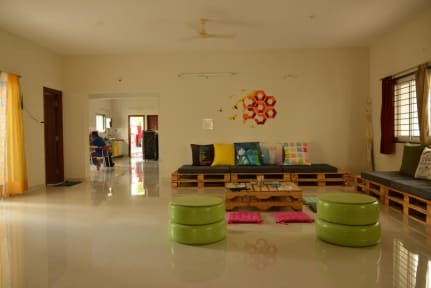 The fact that the hostel is actually a big apartment gives it a real home-away-from-home-vibe, one of the best places I stayed at in India. Highly recommended! I have been travelling for 7/8 months now, so lots of experience in different hostels, but I’ve never been so confused with my experience at what should have been a really great stay! 1) Atmosphere... there was none at all. 2) Staff - I found lazy and ininviting. 3) Beds - I was on the top bunk and was so uncomfortable and so hot! 4) Rules - literally in every direction you will see a do/don’t poster. It gets exhausting after seeing 3, not to mention 20 different posters all over.